Oviedo - the capital city of the Principality of Asturias in northern Spain. Oviedo is the capital of the Principality of Asturias and is the administrative and commercial centre of the region. The city also hosts the annual Prince of Asturias Awards, held in the Campoamor Theatre. 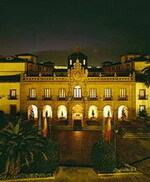 The Oviedo University's International Campus also attracts many foreign scholars. Worth a visit: Cathedral of San Salvador, Cámara Santa de Oviedo, Santa María del Naranco Hall, San Miguel de Lillo, Basilica of San Julián de los Prados, La Foncalada, a Fountain of the 9th century. AC Oviedo Forum is a large, modern hotel situated in a quiet square 200 metres from Oviedo main bus and train stations, and one kilometre from the cathedral. Guests are welcomed by multilingual staff on a 24-hour front desk. The hotel caters well for business as well as leisure guests, with four fully-equipped conference rooms and garage parking. The hotel's La Sosiega restaurant is a place where guests can enjoy the informal but smart atmosphere with low-level lighting and simple, elegant furnishings. Chefs serve traditional Asturian cuisine and house specialities include fabada. The restaurant opens for breakfast, lunch and dinner from Mondays to Saturdays and breakfast and lunch on Sundays. Oviedo has many beautiful churches and palaces which are easy to reach from the hotel, including San Julian de los Pardos (two kilometres), Santa Maria del Naranco (five kilometres) and San Miguel da Lillo (five kilometres). Ayre Hotel Alfonso II is located in Oviedo, Spain, next door to the Palace of Congresses and 500 metres from the Central Train Station. Complimentary wireless Internet access is offered throughout the hotel's air-conditioned public areas. 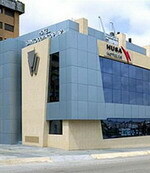 There is a 24-hour front desk and conference rooms are available. Garage parking is provided for a fee. Ayre Hotel Alfonso II has a snack bar and breakfast services are available (surcharge). Room service is available around the clock. The hotel has 19 guestrooms with colonial-style decor, all of which have air conditioning. Other amenities include satellite television, wireless Internet access, and minibars. Complimentary toiletries and bottled water are provided. 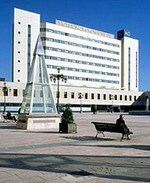 The Barcelo Oviedo Cervantes is located in Oviedo, Spain, within 200 metres of Campoamor Theater. A convention centre is around the corner and Campo San Francisco Park is 500 metres away. The train and bus stations are within 500 metres of the hotel. 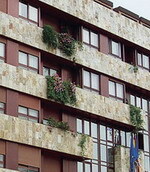 Barcelo Oviedo Cervantes is set in the business and administrative area of Oviedo in a modern building with a front facade of tinted windows and red rock. Breakfast is served in Cervantes Restaurant for a surcharge. The a la carte restaurant also opens for lunch and dinner and provides show cooking at night.There are 72 air-conditioned guestrooms designed in a minimalist style at Barcelo Oviedo Cervantes. Guestrooms feature opening windows and are soundproofed. All guestrooms have satellite television and wireless Internet access, as well as minibars, safes, desks and hair dryers. 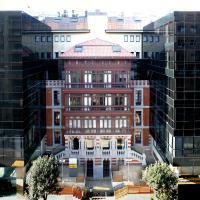 Oca Santo Domingo Plaza is a modern hotel with a blue and sand-coloured exterior, just 700 metres from the bustling centre of Oviedo and its cathedral, in Northern Spain. The hotel's relaxed Deloye's Restaurant serves traditional Mediterranean food, with French decor and views of the interior garden, and guests can enjoy a drink at the bar or coffee in the café, and pamper themselves with beauty treatments. Those with children can make use of the babysitting service, while business guests can use meeting rooms and conference facilities with audiovisual equipment and secretarial services. The hotel is in an excellent position for exploring the surrounding area; the 16th-century cathedral with its Gothic architecture is just 700 metres away, while the mountain village of Amandi is 35 kilometres distance. The Eurostars Hotel de la Reconquista is landmark building, dating back to the 18th century and once a place to stay for princes of the region. It is located in central Oviedo, just one kilometre from the Archaeological Museum. A rich, classical decor has been preserved in all areas of the hotel, including the Florencia restaurant, which serves regional and international cuisine. Detailed wall coving, ornamental patterns and chandeliers also characterise the Rey Castro restaurant where guests can enjoy light snacks and drinks. Guests can pamper themselves with beauty services, unwind with a cocktail in the Americano bar, or sit down and relax in the air-conditioned public areas, including the two-tiered Gil de Jaz lounge with exotic carpets, stone pillars and sofas. 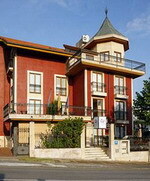 The Silken Monumental Naranco is a modern hotel overlooking the Naranco Mountain, located one kilometre from Oviedo centre, the museum area, and the historic monuments. The hotel offers two contemporary dining options: Restaurant Monumental serves local and international dishes in a smart dining area, decorated in pale gold and deep red; La Foncalada offers light meals and drinks in a chic interior designed with glass and steel, and cocktails are served in the evenings. The hotel offers breakfast services, dry cleaning facilities, and pay parking onsite. Those feeling energetic can make use of a well-equipped gymnasium and an indoor swimming pool, and then relax in the sauna. The 64 air-conditioned contemporary guestrooms are decorated in cream and earth tones with light wood panelled walls.